An aromatic and juicy turkey with a hint of citrusy flavor. 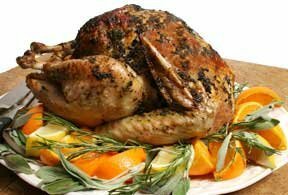 A perfect roast turkey recipe for Thanksgiving dinner or any special occasion. Your guest will enjoy the flavor of this turkey and the delicious turkey gravy made from the herb and citrus-flavored drippings. Need help carving your turkey? See our step-by-step instructions for the help you will need to carve your Thanksgiving turkey. Try your hand at making a homemade pumpkin pie for your Thanksgiving dinner. Use our instructions to guide you every step of the way.